Special while supplies last! FREE Water Jacket with Leopard Motor Purchase! 40mm Diameter by 92mm Long Brushless Motor by TFL Racing. Hand wound for high efficiency of up to 90%. Comes with high quality bearings and neodymium magnets for high power. Includes endbells that are assembled with screws for both strength and ease of maintenance. Includes 4mm male bullet plugs soldered to the motor and a matching set for your esc connection. 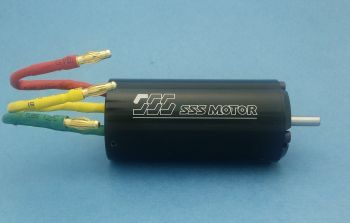 What cell can the sss 2140kv motor handle? OSE: 3s to 4s. But it totally depends on the setup. Email us for help.